Candance Strother, Stephen F. Austin fifth/sixth grade teacher stands in the middle of the FOR Ranger Committee, L. Mike Goodson, Ken Wright, Adalia Maudlin, Valroy Maudlin and Bob Bailey. During a Ranger presentation at Sweeny Elementary, Principal Michael Heinroth walked in dressed as a “woman” due to a successful fundraiser bet he had lost. It was a busy two days for the FOR Ranger committee as they presented educational programs about the San Bernard River to Stephen F. Austin Elementary in Jones Creek on Thursday, March 7 and Sweeny Elementary in Sweeny on Friday, March 8. A total of 217 students received packets containing San Bernard information and blue Ranger t-shirts. Plus, ten lucky students from the two schools, each received a rod and reel when their names were pulled during a drawing. The Ranger program consists of three parts - a San Bernard watershed presentation to raise awareness and environmental concerns of the river, San Bernard fish identification and nautical knot tying. 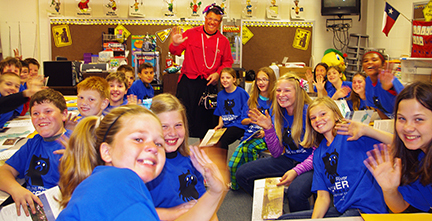 The program is presented to fifth grade students in elementary schools located in the San Bernard watershed area.